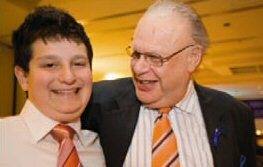 Joshua Brooks Duncan, seen here with his grandfather Israel Rosenfield, started fundraising for CIKA in 2008 at the age of thirteen. He told his story at the CIKA ball in September of that year when he raised $2,800 by auctioning two packets of snakes, bringing his total to nearly nine thousand dollars. Scroll down to read his story. My name is Joshua Brooks-Duncan and I am thirteen years of age. In the Jewish religion this is my Bar Mitzvah year. I completed the formalities of my Bar Mitzvah just under a month ago but the preparation for this began over a year ago. It is the transformation of a child into a young adult and has its roots and customs in traditions that are 40 centuries old. The learning and training during my Bar Mitzvah year prepared me to lead the service on the 26th July and to read from the Torah, which is the scroll containing the five books of Moses. The move into adult life involves the acceptance of responsibility for one’s own actions and one of the lessons I have learned is to have consideration for other people. My reading from the Torah was all about vows and promises and I thought that it was very fitting that my Parsha, which is the portion that I was allocated to read from the Torah, was all about vows. When I sat down and actually looked through it I thought that it was a really good fit with my promise to attempt to raise five thousand dollars for CIKA. Why CIKA? I have, over my thirteen years, known three people who have died from cancer. One of these friends was a five year old boy by the name of Edward, who spent most of his life in hospital. He was a very good friend of mine, and my family. To date, I have managed to raise more than my target of five thousand dollars. I have actually raised six thousand and sixty-five dollars and eighty-five cents. I made this promise, I have achieved this promise and I am very proud of it. This journey that this challenge has taken me on has been amazing and extremely frustrating. It was so hard to raise the money! 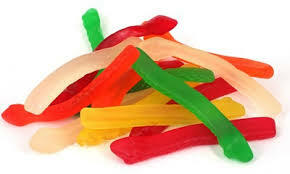 I started by selling fundraising chocolates and snakes but quickly found that the fundraising company got half of every dollar that I made. I soon realised that this way was going to take too long, so I just started to ask people for donations, and this seemed to work a lot better! I was encouraged by my parents to go into houses and offices, where the people were total strangers. I learned, however, that those strangers were kind enough to help me reach my goal, and that every donation, however small, helps. Collecting this money was hard but by doing it I am now able to stand here tonight and give this speech to you. Now, as it turns out, I still have two boxes of snakes! I would like to auction these snakes tonight. I have sold over one hundred and eighty boxes so the two that remain are extremely special. I am selling them as a set. The money that I raise from this auction will contribute to my grand total, which as I mentioned earlier is sitting on six thousand and sixty five dollars and eighty five cents. I want, from someone sitting here tonight, two thousand dollars for these boxes, who will give it to me? In the event, Joshua sold his two boxes of snakes for $2,800. Well done Joshua!